Most people agree that farm raised foods simply taste better than anything produced by industrial agriculture. Ever compared a fresh tomato from a farmers' market to a tomato grown on a megafarm and shipped before it’s even ripened? There’s a dramatic difference. Likewise, you can expect farm raised meats to be much more flavorful than factory-farmed varieties, otherwise known as CAFO (concentrated animal feeding operation). It’s no surprise that top restaurants and chefs choose to serve farm raised meat — it just tastes better! Farm raised meats have a wide range of nutritional benefits. Compared to CAFO produced meat, meat from animals raised on pasture contains less fat, fewer calories, and higher levels of essential omega-3 fatty acids, vitamin E, beta carotene, and other important nutrients. As an added benefit, farm raised meat is produced without the use of growth hormones, nontherapeutic antibiotics, or unsavory feed additives that undermine public health. And of course, unlike factories, farms don’t sicken workers and neighbors by spewing harmful pollutants into the environment. Farm raised meats are typically processed either on the farm, or at small-scale facilities that cater to small scale farmers and strive to maintain high standards of food safety. CAFO meat is chopped up at huge, industrial slaughterhouses where rapid production lines dramatically increase the risk of contamination by foodborne pathogens. As a result, these industrial processing facilities have been associated with major outbreaks of foodborne illness such as E. coli— and are periodically forced to conduct massive recalls of tainted meat in order to contain the damage done to the public. Although pathogens can contaminate any type of food, the abysmal safety record of factory farmed meat from mega-slaughterhouses leads many consumers to choose farm raised meat instead. 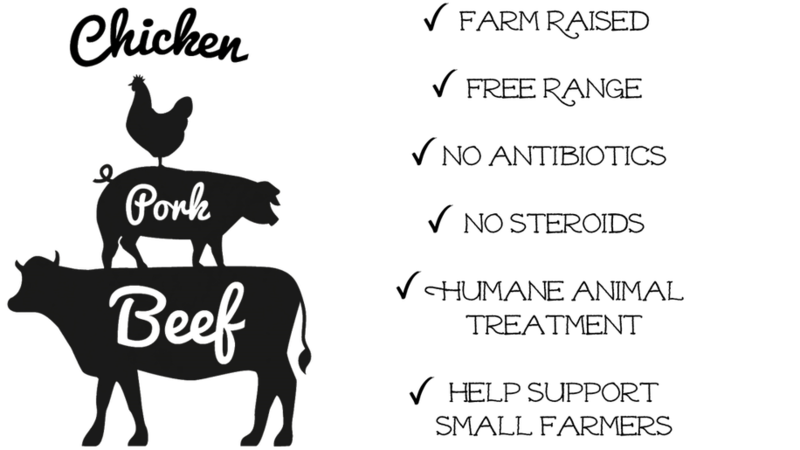 Purchasing farm raised meat helps support farmers who raise livestock responsibly. Given the dramatic shift towards industrial megafarms and the get-big-or-get-out philosophy of agriculture, it’s more important than ever to support the small family farms that continue to raise fresh, nutritious meat and produce, using sustainable agricultural practices. Family farms also play a vital role in rural areas, stimulating local economies, strengthening community ties, and protecting natural resources for future generations. You can make your food dollars count by supporting these farms. On family farms, animals are treated humanely; they're able to graze on pasture, carry out natural behaviors, and live without undue stress or cruel treatment. Factory farms, on the other hand, severely compromise animal welfare by cramming livestock into small, enclosed buildings where filthy, crowded conditions lead to excessive stress and widespread disease. These animals suffer needlessly so that factory farms can produce cheap meat, and this cruelty is subsidized with your tax dollars. Factory farms have devastating impacts on the environment, continuously polluting air, surface water, groundwater, and soil with a host of hazardous contaminants. Family farmers are aware of the importance of environmental stewardship, and use responsible agricultural practices to protect the environment for future generations. When you buy meat from a small family farm, you help support these efforts. Deep Blue Farms is a family owned and operated business. We want to share the healthy benefits of farm raised meat and eggs with you and your family.